More than ever, students need to be able to think critically and creatively, imagine, develop insightful questions, understand complexity, communicate, and work collaboratively. The Columbus Museum of Art provides numerous, in-depth programs for Pre-K through high school aged students to foster these types of essential 21st century skills. These programs range from a one-time visit, to multiple-visit or multi-year programs. Educator professional development programs are available to teachers of all ages and disciplines. Artful Adventures is a unique preschool experience focusing on play, imagination, and wonder in CMA galleries. 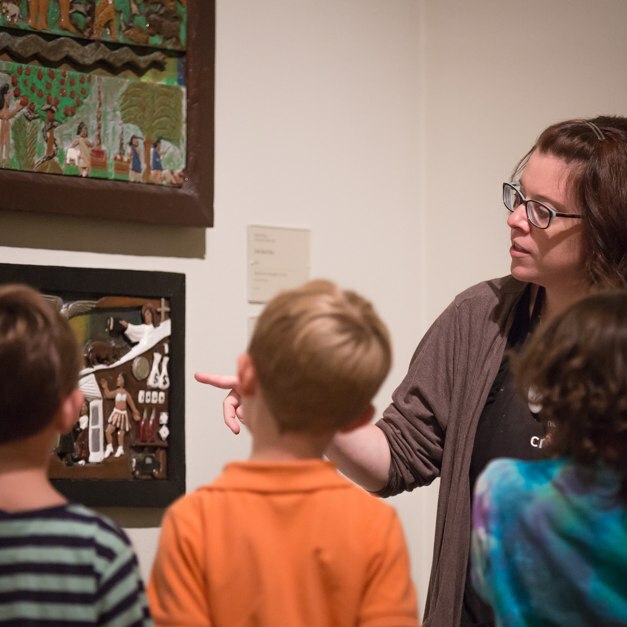 Preschool groups spend one hour exploring CMA with specially trained education staff members to discuss, imagine, and engage in hands-on activities that foster imaginative thinking. To schedule an Artful Adventures tour for a group of 8-24 young children, call 614-629-0359. Artful Adventures is offered from January through May on Tuesday mornings from 10:30AM – 11:30 AM. Artful Adventures is offered from June through August Tuesday through Friday at various times of day. Imagine That is a partnership between CMA and Southwest City Schools’ Head Start preschool centers in which CMA teaching artists visit classrooms to explore creative thinking and imagination through contemporary art practices. Teachers and parents are also provided training in how to foster imagination using art in the classroom and at home. Artful Reading brings all 5,000+ Columbus City Schools 5th graders to the museum as part of a multi-visit partnership program that focuses on fostering critical thinking skills through talking and thinking about art. The experience also extends to the art classroom, where students participate in an open-ended, process-oriented collaborative art making experience fostering creativity, critical thinking, and communication. Made possible with support from Huntington Bank, the Harry C. Moores Foundation, and Sessions Society, a CMA auxiliary group. Critical Works is a multi-week program in which middle school students are engaged in art and performance to foster critical and creative thinking and question development to explore issues of community and society. CMA teaching artists partner with teacher from urban Columbus middle schools that lack arts programming to develop curriculum and identify themes that are relevant to their students. This program takes place both in the school and at CMA. Critical Works is presented by an Ohio Arts Council Arts Partnership grant. Pressing Matters builds partnerships between CMA and middle schools in Appalachian Ohio. CMA teaching artists and language arts and social studies teachers work closely to identify themes of social relevance and engage students in art and performance to foster creative and critical thinking and question development to explore issues of community and society. This intensive program takes place over three days in the classroom and one day at CMA. Pressing Matters is presented by an Ohio Arts Council Arts Partnership grant. Columbus teens are welcome to join us for this weekly drop-in program that includes pop up events in the Studio and Innovation Lab, experimenting with technology and art supplies, and just hanging out. SURGE is a collaboration between CMA, Columbus Metropolitan Library, Wexner Center for the Arts, TRANSIT ARTS and WOSU Public Media, and COSI. For more info visit www.surgecolumbus.org. Teen Open Studio is made possible by a grants from Battelle and the National Endowment for the Arts. Art Lab is a group of 15 enthusiastic high school juniors and seniors from Columbus area high schools. Art Lab is a Columbus Museum of Art internship program where teens get to experiment, take risks and play to create programs, workshops and events for the Museum. Exploring ideas driven by personal interests and community need, they produce projects that forge connections between the Columbus Museum of Art, their lives and their community. This core group of 15 teens examines informal learning, teen roles of civic responsibility, and underserved audiences by addressing inclusiveness in museums and what real community engagement at museums can look like. Teen participants are provided with mentoring, advocating, technical content and emotional support as they develop their interests and take on the role of “Radical Culture Producers”. CMA guided tours are designed to help your students slow down, look deeply, ask questions, think hard, and ponder big ideas. Our skilled volunteers are trained to promote conversation in the galleries, and they encourage students to develop their own meanings and interpretations about works of art. Expect to only study four or five works of art on a tour because thinking takes time. By slowing down, your students will be able to examine carefully and imagine fully. For more on our wide array of tours for preK-12 student see our School Tours. Teaching for Creativity Institute – in this program a select group of Central Ohio educators work for one school year with CMA staff to better understand how to foster creativity and deep learning in their students, and how to cultivate innovative learning environments for their students.This program is open to all educators who are interested in how creativity can transform teaching and learning. Participating teachers will receive classroom materials; learn strategies; gain frameworks; and have the option of benefiting from creativity coaching in your classroom, participating in visits to other classrooms, and obtaining graduate credit through Ashland University. Previous guest presenters have included Harvard Project Zero researchers, The Ohio State University faculty, and additional experts in creative learning. The Teaching for Creativity Institute is funded in part from a grant from The Martha Holden Jennings Foundation.